The swimming pool industry offers several pool industry accreditations to distinguish and recognize the few who have taken the time and investment in themselves to become recognized by the industry as the best. Members of the “APSP” – Imperial Pools Inc is a member of “The Association of Pool & Spa Professionals”. The APSP is the world’s largest international trade association representing the swimming pool, spa, hot tub and recreational water industries. APSP is the leading industry advocate promoting professional best practices through education, industry standards, and safety. APSP members adhere to a strict code of ethics in business and technical practices and share a strong commitment to the safe, healthful, and enjoyable use of industry products. To promote the concepts of free enterprise and service to the public and the industry. To strive continually to gain respect for the industry, both in the local community and on the regional and national levels. To contribute to the health, safety and welfare of the public in the installation, maintenance and operation of swimming pools, spas and hot tubs, and to comply with applicable laws, ordinances and regulations. To support efforts to improve swimming pool, spa and hot tub products and services, and to encourage research and development of new materials, techniques and methods. To avoid statements which will mislead customers in advertising and other efforts to sell products. Be invited to apply for membership by a staff person or Director of the Bureau. Be actively engaged in business, in the BBB’s service area, for no less than 6 months. Supply background information about the company, its principals or other information deemed essential to the BBB. Cooperate with the BBB’s activities and efforts to promote voluntary self-regulation within the business industry. Adhere to established BBB standards of advertising and selling, including the Code of Online Business Practices for online businesses that apply for the BBB On-line Reliability logo, and cooperate with the BBB in matters relating thereto. Promptly respond to any and all complaints forwarded by the BBB, and make good faith efforts to resolve all such complaints in accordance with generally accepted good business practices. Comply with any decisions rendered through the Bureau’s or an alternative provider’s binding arbitration program. Eliminate the underlying causes of patterns of consumer complaints that the BBB may call to the company’s attention. Be free from an unsatisfactory report at the BBB in whose service area the company is headquartered. Be free from any governmental action concerning the marketplace and its customers that demonstrates a significant failure of the company to support the principals and purposes of the BBB. Support the principles and purposes of the BBB and not engage in any activity that reflects unfavorably on the BBB and its members. Refrain from using the name or logo of the BBB for commercial, sales or advertising purposes in any manner not specifically authorized in writing by the BBB. Promptly notify the Bureau of any changes in ownership, licensing status, addresses, telephone numbers, web site and any other information deemed necessary by the Bureau. Fulfill all licensing and bonding requirements of applicable city, county, state and federal agencies and authorities, and provide license numbers upon application for BBB membership and provide periodic updates on request of the BBB. Businesses earning the right to be included in this organization have a strong reputation of taking care of their customers. A Certified Building Professional® is the highest accreditation offered by the APSP to pool builders. It requires a member to study an exhaustive work of reference material, attend classes, and pass a comprehensive exam relating to all aspects or pool construction and design. CBP Graduates must further remain involved in regular continuing education to maintain the status of this prestigious designation. A Certified Service Professional is the highest accreditation offered by the APSP to pool service professionals. It requires a member to study an exhaustive work of reference material, attend classes, and pass a comprehensive exam relating to all aspects or pool construction and design. CSP Graduates must further remain involved in regular continuing education to maintain the status of this prestigious designation. There is a three-tier training and certification program (TECH I, TECH II, and CSP) providing an expanded practical knowledge for pool technicians and service professionals. Courses include the studies of pool structures, electrical systems, hydraulics, pumps, filters, water chemistry, maintenance and more. APSP members who successfully complete all three levels are granted the program’s highest credential – CSP™ Certified Service Professional®. 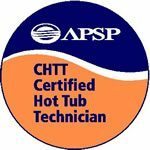 A Certified Hot Tub Technician (CHTT), is the highest accreditation offered by the APSP to pool service professionals in the specialized field of “Hot Tub” service and repairs. It requires a member to study an exhaustive work of reference material, attend classes, and pass a comprehensive exam relating to all aspects or pool construction and design. CHTT Graduates must further remain involved in regular continuing education to maintain the status of this prestigious designation. A Certified Pool Operator is the highest accreditation offered by the NSPF (National Swimming Pool Foundation) to pool service professionals. It requires a member to study an exhaustive work of reference material, attend classes, and pass a comprehensive exam relating to all aspects or pool construction and design. CPO Graduates must further remain involved in regular continuing education to maintain the status of this prestigious designation. Instructors receive comprehensive training and certification to teach the CPO® certification program. These instructors represent every segment in the aquatic industry including operators, health officials, service professionals, builders, manufacturers, property managers, retailers, and academicians. The training these instructors provide has helped protect millions of swimmers by reducing hazards at aquatic facilities. The above combined pool industry accreditations place Imperial Pools Inc in an elite and small group of swimming pool professionals who have studied to master their trade. These distinctions are not attained easily and are a true indicator of competence.